We are a leading Manufacturer of hydraulic power press from Dewas, India. We are an acclaimed name to offer a wide range of quality proven Hydraulic Power Press. Clients can avail from us a precision engineered range of press for various paper mill applications. These presses are designed using the latest technology and are stringently checked to test the efficiency before being delivered to clients. 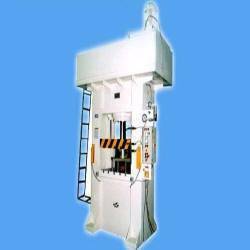 We have also the capability to design these presses as per the specific demands of clients.